Christopher J. Hewitt is a partner and chair of the Tucker Ellis LLP M&A and Corporate Governance practices. He represents public and sophisticated private companies in mergers and acquisitions, takeover preparedness and defense, proxy contents and corporate governance. He also represents investment banks in their capacity as financial advisers to acquirers and targets in public mergers. He can be reached at christopher.hewitt@tuckerellis.com. A shareholders agreement, and its close cousin, the limited liability company (LLC) operating agreement, can best be thought of as a prenuptial agreement among business partners. Sure, everyone loves everyone else, the business is going to be a smashing success, and everyone is going to make lots of money both during your ownership and when you sell—until it doesn’t. Enter the shareholders agreement. Before discussing some of the specific provisions of a shareholders agreement, however, it is helpful to first understand the basic organizational documents that govern corporations and LLCs. A corporation is formed by filing articles of incorporation, also called a certificate of incorporation or a charter, with the Secretary of State of the jurisdiction in which you want to form the corporation. Typically, the corporate law of that state requires certain information be included in the charter; e.g., the corporation’s name and the authorized stock. Other information is permissive; e.g., any provision regarding the management of the company or any permissible changes to the statutory defaults. In addition to the charter, a corporation will regulate the conduct of its affairs or the rights and powers of its stockholders, directors and officers in its bylaws. The main difference between the charter and the bylaws is that typically a charter may be amended by the stockholders only with predicate board approval while bylaws may be amended by stockholders without board approval. Thus, any provisions that you don’t want stockholders to amend should be included in the charter. Finally, state corporate law may provide additional governance requirements; e.g., the vote necessary to complete a merger. State law, the charter and bylaws together constitute the contract of the stockholders regarding the governance of the corporation. In some cases, particularly with private companies, stockholders may enter into an agreement that governs their rights as among themselves. Similarly, an LLC is formed by filing a certificate of formation, which is where the similarity to a corporation typically ends. Where the charter may be robust in its governance provisions so that it cannot be amended by the stockholders without board approval, a certificate of formation typically provides only the bare minimum required—the LLC’s name and address. The real meat is in the operating agreement, which acts in some ways like a corporation’s bylaws but can be more properly thought of as a shareholders agreement among the LLC’s members. In short, whereas a corporation will have a charter and bylaws and possibly a shareholders agreement, an LLC will have a certificate of formation and an operating agreement. 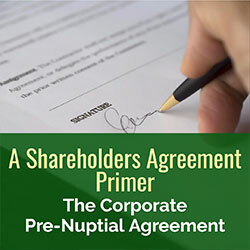 With this brief primer in mind, we turn to a discussion of the most common provisions contained in a shareholders agreement. Putting aside the bylaw-type provisions that may be contained in an operating agreement, we will focus on those provisions that govern the rights and obligations between or among the shareholders. These provisions fall into four broad categories: board governance, voting rights, transfer restrictions and pre-emptive rights. The business and affairs of both corporations and LLCs are managed under the direction of a board of directors or managers. Given this ultimate authority, it is not surprising that shareholders, especially any minority shareholders, want a voice in how the board is comprised. Otherwise—in the case of corporations anyway, where directors are typically elected by a plurality vote—a minority shareholder would never achieve board representation. A typical board governance provision will delineate how many directors will be on the board and how many directors any particular shareholder or group of shareholders may nominate or appoint. In some cases, the agreement may provide that the shareholders must agree on one or more independent directors; i.e., someone who is not affiliated with any shareholder. Thus, for example, a board may consist of one director appointed by one shareholder, another appointed by the other shareholder, and an independent director to break any stalemates. Sometimes, however, if one shareholder has significantly more stock than the others, it will be able to appoint a majority of the board. In that case, unless the minority has obtained any veto rights, discussed below, that shareholder simply has a voice in the boardroom, but no real power. Probably the most common problem that arises in the board governance provision is that it allows the shareholders to appoint equal numbers of directors with no mechanism to solve any stalemates. Most corporate statutes will not solve this problem for shareholders, who then end up in a hopeless impasse, and likely litigation. A well-crafted governance provision should avoid this result, or at least provide for an orderly dissolution of the company or buyout of one shareholder by the other to solve or force a resolution. As a corollary to any board governance provisions, shareholders agreements sometimes contain provisions regarding the voting rights of shareholders on particular matters. In situations where the company has a majority shareholder who has the ability to appoint a majority of the directors and control board actions, minority shareholders may be given the right to approve actions the board may normally take without shareholder intervention. For example, the shareholders agreement may provide that for the board to issue stock, incur debt, acquire or sell significant assets, or take other significant actions that a board may normally take without shareholder approval, the board must obtain shareholder approval. This shareholder approval may need to be unanimous or include some percentage vote of the minority shareholders. In addition, some corporate actions that already require shareholder approval, e.g., selling substantially all of the company’s assets or a merger, may require a supermajority vote that can be obtained only if some portion of the minority shareholders approve. These types of voting rights give the minority shareholder a veto right over the board, which is controlled by the majority shareholder, taking those actions. This power balances out the fact that the majority shareholder controls the day-to-day operations of the company through the board. Similarly, the shareholders agreement may provide that it may be amended only by a vote that requires some or all of the minority shareholders to approve. At a minimum, these types of veto rights will cause a dialogue among the shareholders regarding the fundamental operation of the company, and give the minority shareholders some measure of protection that the majority shareholder does not take advantage of them. These types of provisions, however, should not be drafted to allow the minority shareholder to veto the day-to-day operation of the company. Usually with closely held companies—companies that would typically be formed as an LLC or where the shareholders would enter into a shareholders agreement—the shareholders want to control who their partners are. In particular, they don’t want another shareholder to be able to sell their interest in the company to someone who could become a trouble maker. These types of companies also tend to have illiquid stock. No public market exists to sell the stock of such companies, and any sales would occur only pursuant to privately negotiated transactions. Consequently, the shareholders agreement will provide that no shareholder may sell its stock in the company except in accordance with procedures that allow other shareholders the ability to buy that stock or sell along with the selling shareholder. The agreement may also provide that the selling shareholder may cause the other shareholders to sell along with it. Right of First Refusal (ROFR). This provision allows any non-selling shareholder to buy the equity of any selling shareholder on the same terms and conditions that the selling shareholder offers to a third party. This provision will also typically provide that if any non-selling shareholder passes on its right to buy, those shareholders electing to purchase can buy the non-participating shareholder’s portion. Only if there is any unsold equity after exercising these rights may the selling shareholder sell to the third party. Again, the purpose is to allow the continuing shareholders the ability to control who their fellow shareholders are. Tag-Along Right. Conversely to the ROFR, the tag-along right allows the non-selling shareholders to cause the selling shareholder to include their stock in the sale to the third party on the same terms and conditions as the sale to the third party. If any shareholder exercises this right, this likely means the selling shareholder will not be able to sell as much equity as anticipated unless it can convince the third party to buy more stock. Drag-Along Right. This provision allows the selling shareholder or the board of directors of the company to require the other shareholders to sell their equity to a third party. Thus, if the board has determined to sell the whole company, or the selling shareholder can sell its stock only if it forces all shareholders to participate, this provision allows the board or the selling shareholder to drag the other shareholders along with the sale. Puts and Calls. Somewhat more rare is a provision giving a shareholder the ability to require the company or another shareholder to buy that shareholder’s stock, or allowing the company and certain shareholders the ability to cause another shareholder to involuntarily sell its stock to the company or shareholder. A typical example would be a call right by the company to buy out an employee shareholder’s stock if the employee ceases to be employed by the company, or the corollary put right by the employee to cause the company to buy. There are several issues to consider when drafting these types of provisions. First, who has the right to trigger the provision? A majority shareholder may have the leverage in negotiating the shareholders agreement to cause the other shareholders to be subject to a ROFR or drag right, but the minority shareholders don’t have a ROFR if the majority shareholder sells and cannot drag the majority shareholder. The minority shareholder may have only tag-along rights. Second, how do these rights interplay with each other? A tag-along right should not apply if all equity has been purchased under the ROFR. Similarly, a shareholder who exercises its ROFR should not then be able to exercise tag-along rights. Also, shareholders should not have a ROFR where the selling shareholder has drag-along rights. It is important to carefully coordinate these provisions. Third, what value is paid for the equity? In a right triggered by an offer to a third party, the price offered by the third party usually controls. The price to be paid is often an issue in the put/call scenarios. Some agreements provide that the board has the right to determine the fair market value of the equity. Of course, a board determination would be problematic in a situation where the company is exercising a call right. Some provisions allow for the parties to hire an appraisal firm to determine the fair market value. Other issues in calculating value include whether the appraisal firm can or should apply a minority or a liquidity discount in arriving at the market value. Many of these issues will come down to who has the leverage at the time of negotiations. Another minority protection is the ability of shareholders to maintain their proportionate interest in the company should the board issue new equity. In short, this right allows the shareholder to buy additional equity at the price offered to other shareholders or third parties. Typically, this right will not apply with equity compensation grants to employees or an underwritten public offering. This right may or may not be granted in situations where the shareholder has the right to veto the board’s ability to issue new equity. Shareholders agreements serve a valuable function in closely held and private companies. Ideally, people who go into business together will always agree on how to run that company both on a day-to-day basis and as significant events present themselves. Similarly, one can hope that all shareholders will agree and be fair with one another when one of them wants to sell. History proves that many times this does not happen, even among family members. While a well-crafted shareholders agreement cannot prevent the bad blood that sometimes arises between shareholders, it can at least help them manage difficult situations and, if needed, provide for an orderly divorce. For ease of discussion, I will refer to both shareholders agreements for corporations and operating agreements for LLCs as shareholders agreements. Similarly, I will refer to both shareholders and members as shareholders. An LLC may sometimes be managed by a single member, called the managing member, in which case this discussion would not apply. Where there are multiple third-party members, however, it is more typical for the LLC to be governed by a board of managers. Again, for simplicity, I will refer to the members of a board as directors. It is important to note that the governance provisions for a corporation will dictate who can nominate the directors and that the shareholders party to the agreement will vote for the other shareholder’s nominees, but the directors must be elected by shareholders generally, even those not party to the agreement. In an LLC, the member(s) may directly appoint their representative to the board. In one particularly noteworthy situation, in 2015, Chancellor Andre Bouchard ordered a custodian to oversee the sale of TransPerfect because the shareholders, who effectively each own 50% of the outstanding stock, who had no shareholders agreement and who were once engaged to be married, were hopelessly deadlocked. Chancellor Bouchard’s order was recently upheld by the Delaware Supreme Court. In another case making its way through the Ohio courts, a brother and sister who each own 50% of Dayton Heidelberg Distribution Co., and who do have a shareholders agreement that is not well drafted, are currently litigating control of that company.